Romantic and feminine, pink wedding cakes are a gorgeous addition to any special day. Because of the versatility of this color, pink is one of the most popular choices among brides everywhere. Ranging from hot pink to pale rose and everything in between, you can use the shade to create the perfect cake for your wedding celebrations. 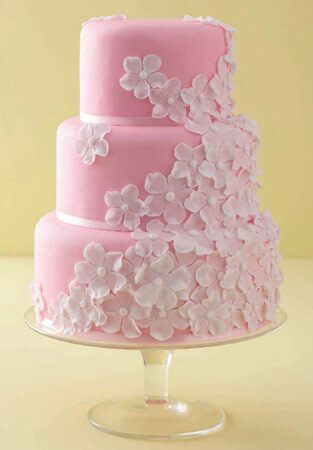 For brides who love the color pink, a cake covered completely in pink fondant or butter cream is the perfect choice. At once, this look conveys both femininity and elegance while adding a sophisticated vibe to your wedding day. If you love the bolder pink hues, consider an eye-catching hot pink cake with black accents. Alternatively, choose to combine pink with other vibrant shades, such as bright orange or green for a stand-out look. Brides who prefer pale pinks can choose a soft rose cake with white piped icing, or incorporate pale accent shades such as soft green or chocolate brown to go with the pink hue. If none of these colors suits you, you can always play around with different color combinations until you get exactly the look you want. Brides who aren't a fan of all-over pink can still add a splash of color with a few creative additions. 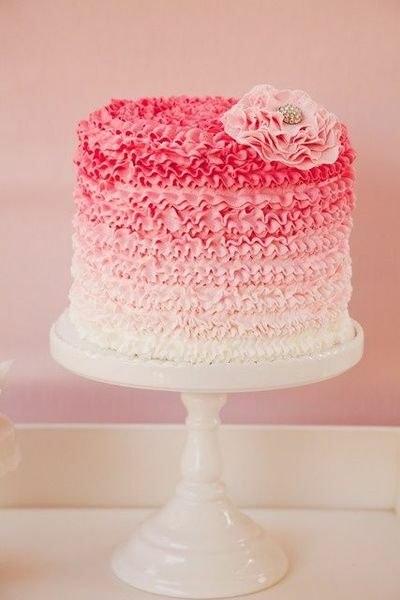 For example, consider using pink as the accent color on an otherwise one-color cake, such as pink butter cream ruffles or a bubble or pearl treatment. For an eye-catching look, you can use fuchsia or magenta fondant cutouts in shapes you love, such as hearts or flowers. 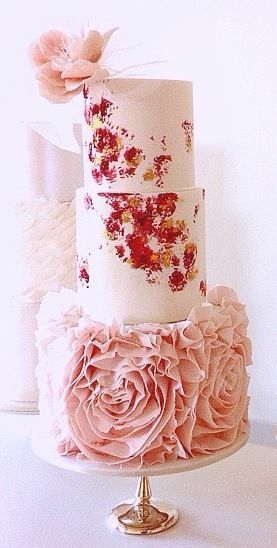 A damask pattern on the layers of your cake, when created in the shade of pink you choose, is another good choice. This is one of the most popular cake decorating techniques, and will help your pink wedding cake stand out. You can also incorporate a splash of color into a classic white cake as well. 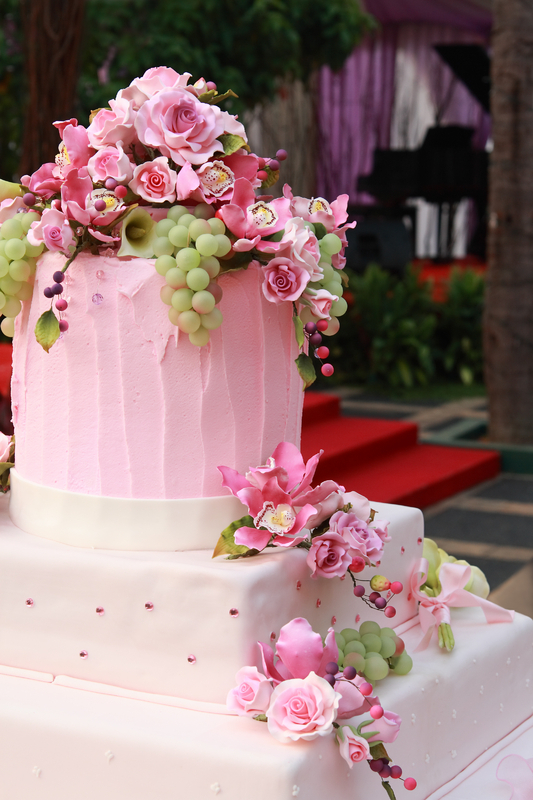 Fresh pink-hued flowers, such as lilies, roses, peonies, gerbera daisies, and orchids, look beautiful when adorning the base of your cake or cascading down the sides. Your cake decorator can also create marzipan or gum paste fruits, such as cherries, strawberries, or apples, to decorate your cake and inject a bit of color - plus, it's very modern when used to decorate the layers of your cake, or as a cake topper. The color pink is extremely versatile, and can be used to inject personality and color into your wedding cake. No matter what shade you prefer - be it vibrant magenta or pale pink - you can use these creative ideas to create an eye-catching pink wedding cake for your special day.